Remember my friend Lindsay? Today I’m finally sharing one of her recipes with you! It’s a simple recipe actually…but delicious! Cate and I got to eat dinner at Lindsay & Aaron’s house the other evening when Nate was working late (the PhD is ALMOST DONE!). Anyway, everything tasted awesome, as usual. Even these brussel sprouts! Who’d have thought? 🙂 Seriously, I actually like brussel sprouts pretty well, and these are the best ones I’ve had. Aaron just talked trash about how they smelled…yeah, he doesn’t like them. 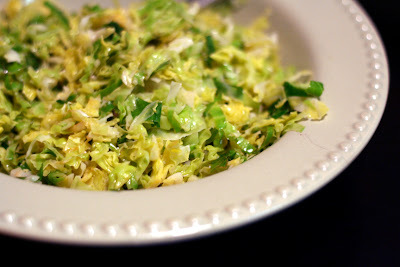 So, I’ve warned you – if you hate brussel sprouts, this recipe still may not be for you. But I thought it was yummy. I am so excited for tonight. And, yes, I’m a loser and the excitement is for a TV show. But not just any TV show. It’s the Project Runway season finale!!!! Can’t wait! Oh man, if Christian wins…let’s just say he better not win. Sorry, dude, you’re talented, but come ON. And did he REALLY win fan favorite? I’m still in shock. Goodness. Okay, but seriously, I love this show. Love love love it. Wait, can you tell I like this show? And…I love Tim Gunn and I cannot lie. Tim rules. Today’s picture is of my new shoes. My first animal print EVER. I’m so boring, I know, but at least I’m finally letting the animal out, a little. 🙂 The real question is, would Tim like my shoes? 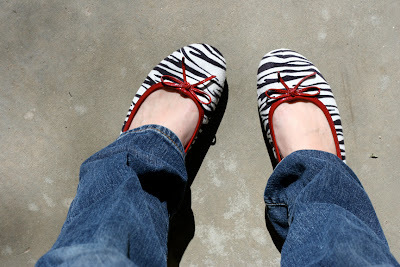 I’m actually dying to go get some Bitten jeans at Steve & Barry’s, but since I’m not quite back to my pre-pregnancy size (which means I’m not yet wearing these), I have to live it up with shoes. By the way, if you haven’t gotten on the Runway bandwagon…it’s never too late to start. Bravo plays all the old episodes pretty much 24/7. But be warned…it’s a lot like Pringles. Once you start, well, you know…although, I must admit I’ve never actually EATEN a Pringle, so I wouldn’t know much about that. Yup, I’m weird. I like milkshakes. They’re yummy. And, believe it or not, I didn’t discover them until Nate’s mom came onto the scene. That’s right, yet another thing for Nate to add to the “I can’t believe Jane hadn’t tried this until she met me” list…like relish on a hot dog. It’s true. I’m a weirdo. Okay, back to milkshakes. They’re easy and way good. All you do is blend milk, ice, sugar (to taste) and a bit of vanilla (chocolate syrup is, of course, another option). That’s it. So yummy. 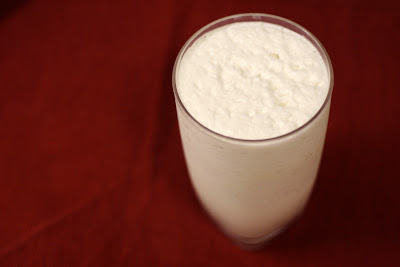 And the good news is that it tastes a lot like an ice cream shake, minus all that crazy fat and sugar. I would say it may even be a bit more refreshing. I did mess it up a little the other night by adding too much ice. Well, I suppose some people would have liked it better – it got much thicker and foamier. I thought it was too much…although it made for a better picture. 🙂 Figured I’d mention it so you could finesse this super fancy recipe to your liking. Sorry the menu is so late tonight…let’s just say that tonight is one of those tricky crazy mom nights. I won’t go into details, but I gotta get this up quick and run! 🙂 In fact, I’m just going to TBD a few of the nights and finish the week’s plan later. I REALLY need your menus this week! All of our computers are Macs. I love them. But it is kind of rough when your computers are cooler than you. And the Mac commercials are definitely cooler than I am. Today’s Song of the Week is from one of those commercials. Which means you’ve probably already heard it, but I still think it’s great and this is my blog so I can do what I want. Hee hee. 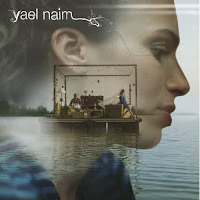 I was slow in discovering Yael NaÃ¯m’s song New Soul. With DVR on our cable box, I NEVER watch commercials. Nate had fun teasing me because I hadn’t heard this song when the rest of America already had it memorized. So, in case you’re like me and haven’t heard it yet, be sure to check it out. It is a happy little song. My favorite song on Yael’s album album is called Far Far. Love it. The rest of the album is very cool, too – a mix of French, English and Hebrew (Yael is Israeli and hit it big in France) with interesting and different music. New Soul is this week’s official Song of the Week, however. Here’s why: last night when Cate and I were making dinner, it was the first time she’d heard the song. She loved it and sang the “la la la las” like there was no tomorrow. It was SO CUTE. Plus, right after Anna was born, Nate dubbed it Anna’s song. This song will always do my heart good. Quick note: I’ve improved my links in the Song of the Week posts. If you click on the names of the songs/artists it will take to you to the Amazon MP3 download, where you can preview and purchase the songs easily. Amazon MP3s are DRM-free, which means once you buy the song it doesn’t track how many computers you have it on. Very cool. Plus a lot of them are less expensive than iTunes. Double cool. While my attempt at chocolate truffles may not have been stellar, I did forget to mention something I discovered that I HAVE to share with you all…something I did RIGHT. I’ve always heard that coffee enhances the flavor of chocolate. I’m not a big coffee fan, so usually when a chocolate recipe calls for it, oops, I left it out. However, I decided to give it a try this time around. Let me tell ya, what they say is true. The truffles do not taste like coffee at all AND the chocolate taste is so much richer. (As if you need to make truffles as rich as possible…but if you’re gonna go, go all the way, right?) ANYWAY…it’s true, it’s true. The coffee definitely gave the chocolate taste more depth. It’s an amazing little trick. For all you coffee drinkers out there, yes, I used nasty instant granules. I know, I know. NASTY. But when you only need 1 tablespoon in a recipe AND you know you’re not going to taste the coffee anyway…well, instant granules here I come. 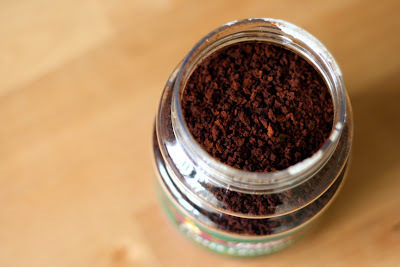 If your truffle recipe doesn’t have coffee in it, you could probably just add 1 Tbsp and be safe. I would just add it at the end when you add in the other flavorings, like liqueur or oils. I ventured into the world of chocolate truffle making the other night, with mixed results. The truffles TASTE great, but are far from culinarily artistic perfection. I thought today I’d share what I did along with my questions, hoping you can teach me the right way to do this! Want the job as Truffle Teacher? All you have to do is post a comment! I’m mostly concerned with technique, but of course if you have a good recipe please share that as well! For reference, THIS (click here) is the recipe I primarily used (although I referenced a few others as well). Okay, the Truffle 101 Discussion Group is now beginning. – When they say finely chop the chocolate, they mean FINELY chop the chocolate. I just had a few small pieces here and there (see pic), but they were just too big to melt in the heated cream. – You can store your finished truffles in the fridge for weeks, but eat them at room temp – so much better when they are nice and soft. – I wanted to do some hazelnut-flavored truffles. I split the recipe in half and added ~1 1/2 tsp of hazelnut oil, but you honestly cannot tell that they were flavored. Has anyone used hazelnut oil in a similar situation? How much should I use? 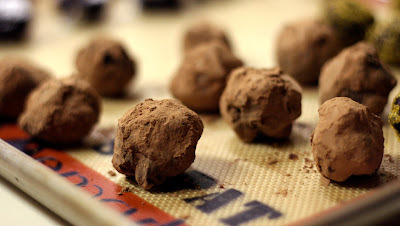 – When should you form your truffle balls? One recipe said to leave the mixture out for 1 hour then make the balls. I did that – the chocolate was still so soft it was nearly impossible to work with. Another recipe said to refrigerate for 1 hour then make the balls…so I put the mixture in the fridge for 30 minutes. When I tried to make the truffles I actually BROKE the melon baller the chocolate was so hard. It was the biggest pain making the balls (which is why mine look so lumpy). What technique do you suggest? Do you use a melon baller, fingers, two spoons? HELP! – What is your favorite flavoring and in what quantities should they go into the recipe? I THINK that was all the questions/troubles I had. Seriously, if you’ve made truffles and they came out, tell us what you did! I’m happy to announce the winners of the ProFlowers gift card giveaway! Cora, who said: Chocolate, strawberries, and flowers….Jane you sure know what’s important on V-Day. Lori, who said: Bring on those chocolate covered strawberries! Congratulations, ladies! I know you’ll put those $50 gift cards to good use! Please send me an email at weeklydinners@gmail.com to claim your prize! 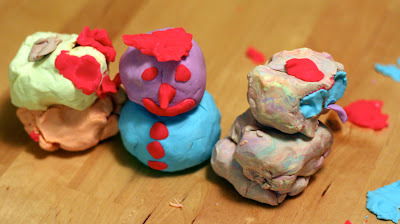 Cate and her dad were busy making snowmen. It was so cute. Hey, if there’s no dinner on the table, this sure is a good substitute. I have a LOT of carry-overs on my menu from last week…I think I must have been half asleep when I went to the grocery store since I forgot half my ingredients! You may be wondering what we ate at all, and, to be honest, I don’t really remember. We didn’t starve, so that’s good. 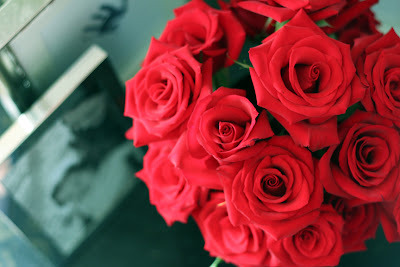 Don’t forget to enter the ProFlowers gift card giveaway! You have until Midnight tomorrow (Sunday, 2/17) to post a comment…click here to enter!